Nairobi — Kenyan investors could have the opportunity to participate in the Sh7 billion rights issue by Bank of Kigali Group Plc (BK), a holding company of Bank of Kigali Plc, BK Insurance, BK Capital and BK TecHouse. The follows the approval by the Capital Markets Authority (CMA) for the company to cross-list the Nairobi Securities Exchange (NSE). This marks the cross-listing of the first Rwandese Company on the bourse. The issuer was listed on the Rwanda Stock Exchange (RSE) in 2011 through an Initial Public Offer. CMA Chief Executive, Paul Muthaura says the cross-listing will facilitate cross-border investments, further strengthening the Memorandum of Understanding entered into between capital markets regulators in the region through which a common blueprint on the integration of the East African capital markets was adopted. "It will further enhance Kenya's position as an international financial centre and gateway for regional and international capital flows," Muthaura said. Investors are expected to benefit from the opportunity to participate in the diverse income streams of BK Group and its future capital growth. 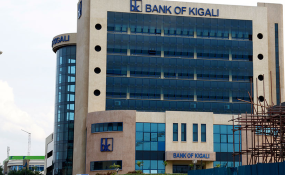 The proceeds of the rights issue will ensure that subsidiaries, and in particular Bank of Kigali PLC, are adequately capitalized to comply with capital adequacy requirements and implement its growth strategy. 'Untaken Rights will be placed with qualified institutional investors on the NSE (rump shares) through a private placement, and thus will not be available to the general public in Kenya', BK Group's information memorandum states.